I’m looking forward for using SSD drive in Omnia (for backups, multimedia, …). Is it possible to use M.2 drives in switchable PCIe slot instead of mSATA? I have read quiet a lot, but I’m still confused, because internally M.2 should be compatible to mSATA but it enables to attach storage to PCIe links. Omnia offers in this case PCIe links. Have you tried this combination? Will it work fine? Would this NVMe SSD work with the TO? M.2 has different form factor than mSATA; you can buy adapters on eBay, but you’ll probably have trouble fitting M.2 2280 drives inside (majority of M.2 drives are 80mm long); M.2 2242 (42mm long drives) should fit without problems. Note that M.2 drives can be either SATA or PCIe (NVMe). Thanks for replay. Do you think, will be M.2 2242 compatible in NVMe? I know there is mini PCIe port switchable to mSATA, so probably it should be compatible. Notice that there’s no space for longer (2260/2280) cards. I’ve yet to see a NVMe M.2 2242 SSD. I was looking too and I didn’t find it. Did you already have a SATA M.2 2242 SSD? Why didn’t you use a mSATA drive? Unless the onboard SATA controller has performance issues. The M.2 SSD in the picture is 32GB from some HP laptop where it was supposed to be used as cache. I’ve got two of them, and no real use for either. Are there any performance issues with onboard SATA? I didn’t notice any of them. @ender I would like to put an SSD inside of my router too. Could you please answer a couple of questions? Do I understand correctly that NVMe M.2. SSD can be inserted via adapter into any of the slots? I mean there is one (nearest to the processor) slot with mSATA which can be used for SATA-based (AHCI) SSDs via adaptor. I can see on the photo you’ve attached that you use that port for your SSD. Are two other mini pci-e ports electrically-compatible with NMVe? What are the maximal speeds Turris Omnia can reach for NVMe and mSATA for read and write? If you can provide the numbers only for mSATA solution - it still would be better than nothing. I mean it won’t worth to use SSD if the speed is comparable to HDD. Regarding M.2 2280, I think it is possible to use mini PCI-e extender first (like that one: ebay) and then insert mini PCIe to M.2 adapter in it. 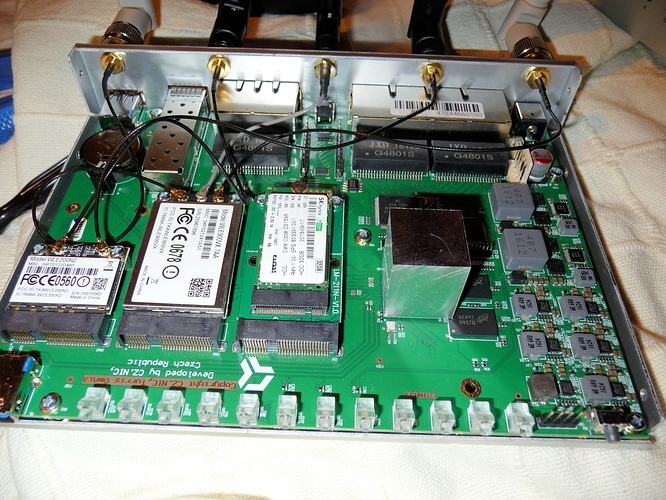 The FCC cable will make it able to glue the part with M.2 adapter and SSD to the top of the router’s box inside. The reason why I want such a weird thing (use M.2 2280 SSD in Turris Omnia) is the fact that >95% SSDs are M.2 2280 - they are much easier to buy and easier to sell. At least in my country.